How to Use Syncios iOS & Android Manager ? Syncios iOS & Android Manager supports managing data on and off your iPad, iPhone, iPod, Android phone, allowing you easily transfer data including music, video, photo, apps, contacts and more between iPod/iPhone/iPad/Android phone and PC. This iOS & Android Manager also features more functions to better manage your iDevices & Android phone, such as Ringtone Maker, handy Audio & Video converter, etc. How to Register Syncios Manager for iOS & Android? 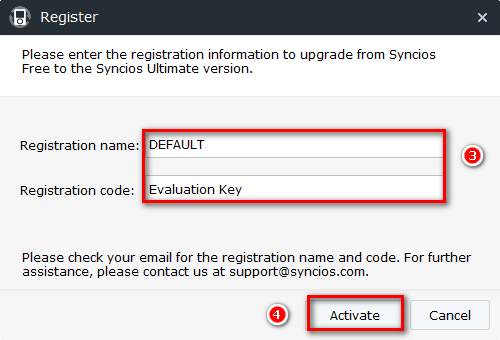 You can keep and use the free version or simply upgrade to Ultimate version with Syncios registration name and code. What's the difference between Syncios Free and Ultimate Version? 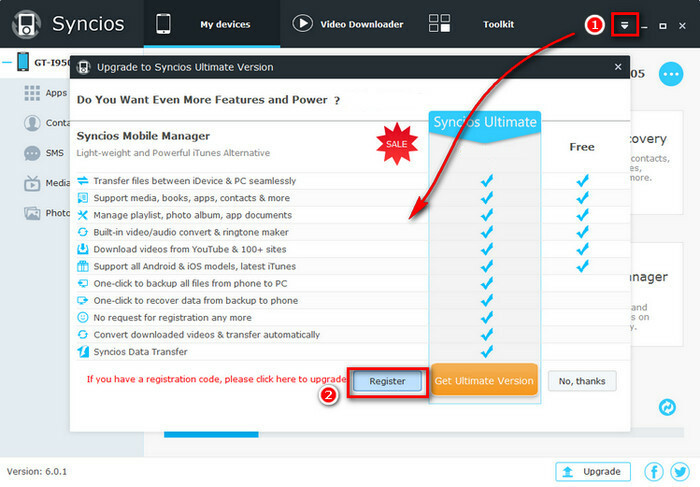 Step 1: Click button on the upper right corner, and click Register to get Syncios Ultimate version. Step 2: You will see the promotion prompt. This page shows differences between Pro and Free version. If you have already purchased, please click Register. Step 3: Copy and paste your Registration name and Registration code. Step 4: Click Activate button to finish registration. 1. Under My Device tab, choose items to manage from the left panel: Media, Photos, Apps and Information. 2. Choose the operation to backup data from iPhone, iPad, iPod or Android phone to PC or copy from PC to Android or iOS devices. 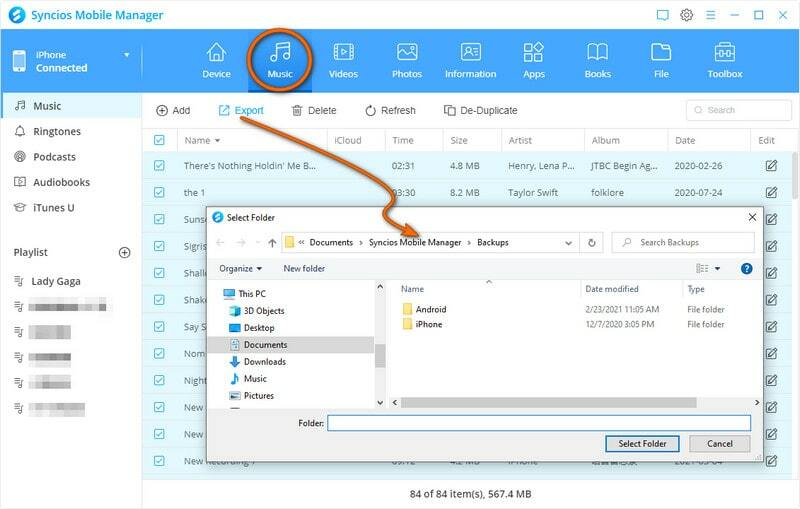 To transfer Android/iOS music to Windows PC, click Media tab on the left panel of Syncios and then choose the audio type from right panel, including Music, Ringtones, Podcasts, Audiobooks and Voice Memos. Just hightligt Music, all music on your iPhone/iPad/iPod/Android phone wil be displayed on the main window. Simply select the songs you want to transfer and click Export option. To transfer Android/iOS videos to Windows PC, click Media tab on the left panel and choose the video type from right panel, including Videos, TV Shows, Music Videos, iTunes U. Choose video files in your device, and then press Export button to transfer videos from Android or iOS to PC. 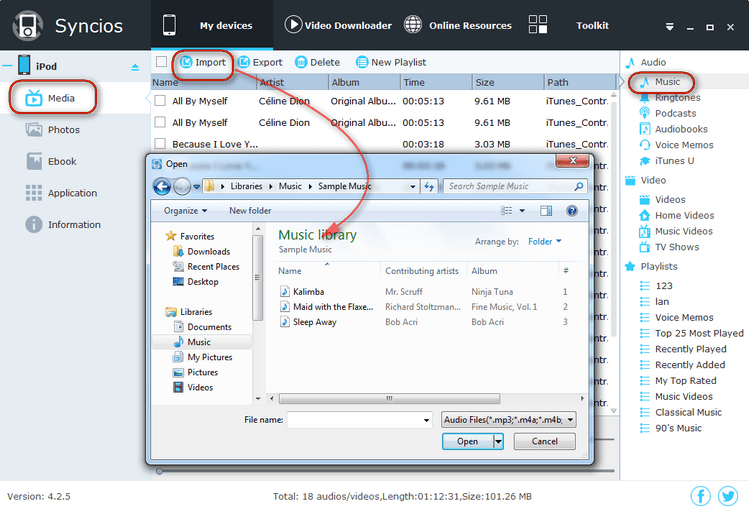 It's not a hard job to transfer music/videos/photos from Windows PC to your Android/iOS phone. Simply press Media, Photos tab on the left panel of Syncios. 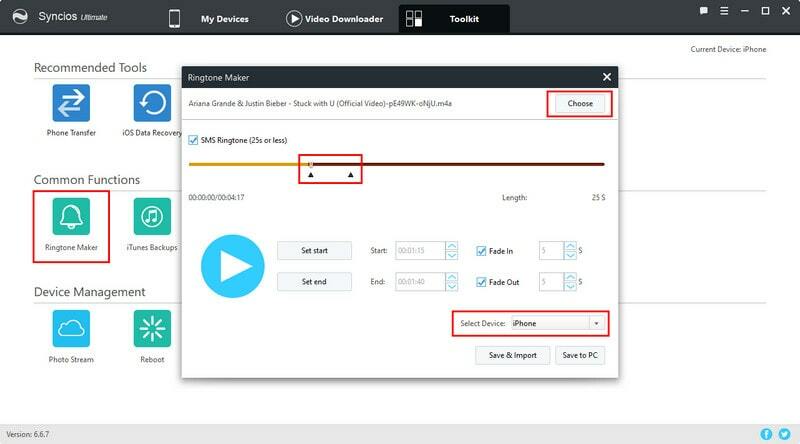 Then click Import to browse your PC for the video, audio, or photo files you want to import to your Android or iOS device. After finding them, click Open to transfer music, videos, photos to your Android phone or iOS devices. Note: Pro version supports automatically converting and importing downloaded videos to your iOS devices, just tick "Automatically transfer to current device." before downloading, it also allows you to select the download quality, output video format, video size, conversion quality. Syncios not only gives you better experience to manage your iPhone, iPad, iPod, Android, but also offers more amazing functions such as built-in video converter, audio converter, and ringtone maker. How to convert video for Android phone or iPhone/iPad/iPod? 2. Choose output video format supported by Android device or iPhone, iPad, iPod, including MP4, M4V and MOV, and then click Browse to select an output folder for the converted video file. Now, press Convert button to start the video conversion process. 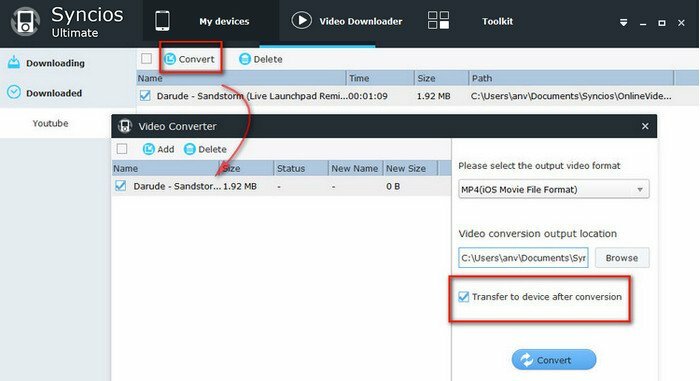 Tips: If you would like to transfer output video file to current device automatically, please simply check Transfer to device after conversion option.You can also choose the Video Size and Conversion Quality.